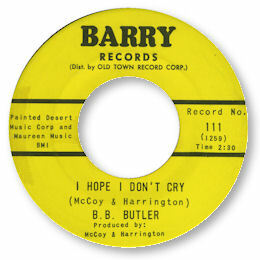 Bee Bee (or B B on Barry) Butler was a big voiced R & B singer from New York who cut a small number of 45s over a decade or so. All of the tracks she cut were of a very high quality – not surprising as she worked with musicians of the calibre of Leroy Kirkland and Clyde Wilson. 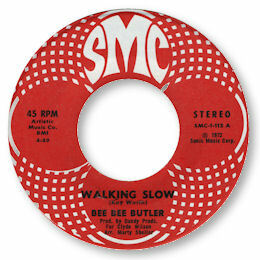 Her first release was for Old Town subsidiary Barry and a fine double sider it was too. The bluesy I Hope I Don’t Cry just pips “As Long As You Love Me” thanks to some lovely guitar fills and a gently humming male chorus. I Can’t Stand Another Hurt captures a similarly mournful mood with the full horn section and meandering tenor sax hovering between soul and blues – with a slight jazzy touch as well. A lovely disc full of feeling. Walking Slow has the same feel and mood as the tracks that Esther Phillips was laying down for Kudu, and was probably aimed at the same market. A real grower this one – wonderfully subtle playing from Pretty Purdie, Richard Tee and co – and a top class arrangement make this a track to return to time and again. Sadly, despite these fine tracks B B never got anywhere near the charts. Thanks to Dave Porter for the suggestion.